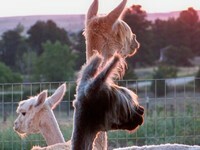 Openherd: Goldyn Rae Alpacas - Get great deals on alpacas in Openherd auction lots! 3x Champ, 59.5 Density! 6.2 Spread!! Top 2% SD! True jet blue black. If you are looking for as black as it can get with no brown tipping, 90 has it. He is a robust male, well balanced with exact conformation showing strong bone and a beautiful Suri head. He is the son of Sierra' Bonita's Sirius Black an 8 time Champion, Futurity Reserve Herdsire of the Year, Macgyver son. 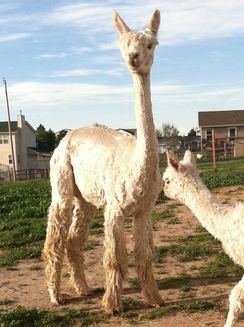 90 Proof has a dense fleece with strong luster and he has an easy going temperament. His dam, Twist N Shout is from the Sierra Bonita program and exhibits a low micron of 22.1 at five years of age. 90 Proof's full sister, Cassis, was Reserve Champion at the 2011 GWAS show and at a year she had a histogram of AFD 16.34, SD 3.83, CV 23.46 and a comfort factor of 100 and she has continued to maintain fineness. 90's first year potential in the showring was cut short due to an unfortunate tender fleece condition. However, while the judge remarked on his tender fleece, he was placed 2nd at the 2009 Great Western Alpaca Show in a full fleece class of 7! In the shorn classes in 2010, he took first in class at all four shows he competed in, AOBA, Futurity, CABA and Northwest Alpaca Showcase. His dark color is coming through, even when bred to white females. Bred to Mont Blanc Son! 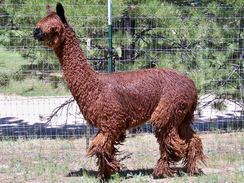 We are very excited to welcome this top-of-the-line alpaca to the Goldyn Rae farm! Hip Hop is the daughter of Pucara International's very best colored female, Pucara Sonata. Hip Hop's sire is the famous Chakotah, who won several championships including Get Of Sire at GWAS, Txolan, and the 2011 Nationals, as well as 2011 FUTURITY Reserve Dark Herdsire of the Year. Chakotah's grand sire is the one and only Kahuna!